Hyatt Gold Passport has launched a double points offer for brand new Park Hyatt Sanya Bay Resort in China. The offer is valid for stays until May 31, 2015, per the information on the hotel’s offer page (email that Hyatt sent indicated April 30 ending). The “opening rate” that comes with breakfast and afternoon tea seems rather high for me. At least it is the highest of all the rates that this offers. This is probably a right place to burn points considering the rather high sticker prices that the hotel has. I would imagine that it is heavily dumped by 3rd party Chinese consolidators. 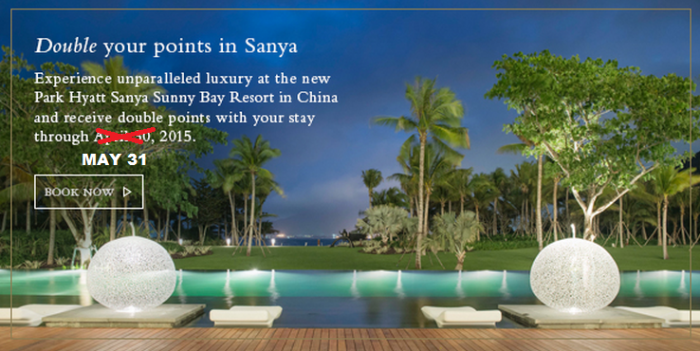 Offer is valid from 15 February, 2015 to 31 May, 2015 at Park Hyatt Sanya Sunny Bay Resort. Reservations are subject to availability. Hyatt Gold Passport members will earn double Hyatt Gold Passport bonus points for stay at Park Hyatt Sanya Sunny Bay Resort at the opening offer rate from 15 February, 2015 to 31 May, 2015 when providing their Hyatt Gold Passport membership number. Only one bonus may be earned per member, per stay. Additional charges apply to room-type upgrades. Additional guests may be subject to additional hotel charges. Guest is responsible for all charges not included in package. No refunds for any unused portion of package. Offer is not valid with groups/conventions and may not be combined with other promotional offers. A limited number of rooms are allocated to this promotion. This offer is subject to the terms and conditions of Hyatt Gold Passport.